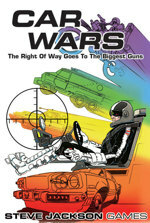 Daily Illuminator: Car Wars Classic: It Is Here (Or Was)! November 25, 2014: Car Wars Classic: It Is Here (Or Was)! It has been a while, so I had forgotten how cool it was to have a product I was involved with land on my desk. Not a prototype, not a printer's proof, not an advance copy, but the real, actual game just like the ones the fans get. We're talking, of course, about Car Wars Classic. Shiny box! Compact, info-packed rulebook! Thick, beautiful counters! Dice! Turning key! Two-piece, double-sided map! Table and record sheets! I'm so happy. And we're already out of them. Our hobby distributor has sold their entire stock to retailers, so the ones your local store will receive (or have already received) are it. And the few copies we held back for Warehouse 23 are already gone, too! A reprint will take a while, but we're on it. On another level, this tremendous reaction to Car Wars Classic gives us a turbocharge of energy and enthusiasm for the new edition of Car Wars, which I continue to work on even as we bask in the glow of brand-new, glorious Car Wars Classic! Good times, baby. Good times.